You are here: Home / Holistic Health / Massage / What is Hawaiian LomiLomi Full Body Massage? 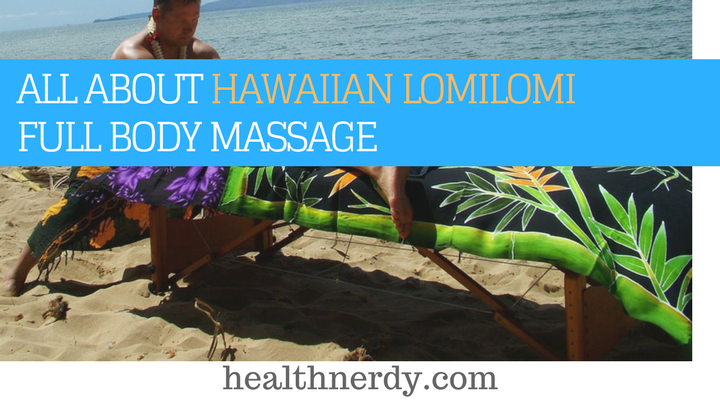 What is Hawaiian LomiLomi Full Body Massage? LomiLomi is a traditional Hawaiian technique, often called the “Loving Hands” massage. Also known as lomilomi, the Hawaiian LomiLomi full body massage derives from the philosophy of ‘Huna,’ which has deep spiritual connotations. It is based on a profound, holistic thought that seeks to achieve harmony in all aspects of our life through enlightenment, massage practices, and channeling energy flow. The following article provides a complete overview of the ancient tradition, its modern variants, and sacred healing benefits. What is LomiLomi Massage and its philosophy? What is a LomiJuma Massage? What are the benefits of LomiLomi Massage? Hawaiian LomiLomi massage is based on the belief that our memories are not merely registered in our mind but in every cell of the body. The massage uses long rubs along the length of the body, releasing trapped patterns and behaviors. These usually manifest themselves in the form of muscle tensions and energy blockages. LomiLomi massage begins with a prayer or chant when the practitioner places his hands on the back of the client and seeks divine intervention in the healing process to follow. The client might also be asked to contemplate on the intention behind the massage to make it more successful when the process begins. Music forms an integral part of the Lomi massage techniques. Therapists might hum as they make dance-like movements channelling energy flow. The vibrations are believed to resonate with the human body, releasing trapped energies and blockages everywhere. LomiLomi Nui is the name given to the ancient Hawaiian massage tradition that originated in the Hawaiian islands. The word ‘LomiLomi Nui’ stands for ‘The Great Massage’ and was a form of sacred bodywork once performed in the temples. The main idea behind the tradition was to inspire the life force in our bodies and ingrain a better understanding of the universe - both around and within us. LomiJuma massage is known for relieving stresses by employing a combination of different techniques including Hawaiian kneading, stretching, and swaying. Essentially a combination of several massage traditions, the massage therapist uses a variety of oils and natural products to achieve the anti-stress effects that liberate the mind, body, and soul. One of the main benefits of the massage is its ability to unlock blocked energies in the body, freeing frozen joints, and releasing muscle tension through the use of the three unique massage movements. The Hawaiian Lomi-Lomi massage works at many individual levels: it relaxes the physical body, rejuvenates the mind, and uplifts the spiritual energy, removing negative emotions such as fear and anxiety. It has long been known that massage therapies can help reduce the intensity of pain and anxiety before and after surgeries. They are also considered useful in a variety of medical conditions. Reiki is a Japanese art of healing that focuses on body energy. It uses techniques to relax muscles and promotes the flow of our natural energy. In fact, the word ‘Ki’ in ‘Reiki’ stands for the life force energy that continually flows through us and keeps us alive. Reiki practices aim to balance energy levels, relying on a variety of techniques including the proximity of the healer’s hands to help balance our inner energies. Certain hybrid forms of Reiki have also been developed, which include the Reiki massage. During the process, the individual undergoing healing lies flat on his stomach, usually on a Reiki table. The Hawaiian massage, like its Swedish counterpart, achieves a relaxed state of mind, improved blood circulation throughout the body, and a regulated blood pressure. However, there are many differences in the two forms. What differentiates LomiLomi is the deep connection that is established between the client and the practitioner right from the moment the massage begins. The latter uses long, free-flowing movements characterized by a warm and loving touch guided by the right, healing intention. This, in fact, forms the very essence of the Hawaiian tradition. Another difference is in the way the massage proceeds with large parts of the client’s body being uncovered. The practitioner guides his intricate maneuvers from the shoulders to the feet, unlike the Swedish deep tissue massage. The Hawaiian LomiLomi full-body massage involves long and smooth movements spanning the entire length of the body, so clothing is usually kept to a bare minimum. Clients lie down on a traditional mat or on Lomilomi massage tables and are provided with small towels to preserve their modesty. Therapists usually massage several areas of the body at the same time. The best way to understand the right LomiLomi massage draping is to call up the therapy center and inquire about their methods of working so you can then dress accordingly within your comfort zone. It is important to note that the sacred healing technique may not be suitable for everyone. It is best to seek consultation with your doctor before you opt for the procedure. This is particularly important for patients undergoing surgery and other treatments. The massage therapist will also ask you about your medical history before the lomilomi process begins, make sure you intimate them about any medical concerns beforehand. It is imperative for pregnant women to consult with their doctor and also notify the LomiLomi massage practitioner about the same before the session so they might advise accordingly. One can try the Lomilomi massage at a spa that offers massage services in the Hawaiian tradition. However, few spas offer the traditional form of the bodywork and instead inculcate elements from the procedure into their own offerings. Hotels offer Hawaiian Lomilomi massage packages to guests as well. Those seeking authentic Hawaiian traditional massage must check with private practices that offer such services not commonly found in modern spas. You can also watch a video on Lomi massage online to get to know the technique better. There are both male and female practitioners providing their services for the massage. The LomiLomi full body massage is based on the mind-body connection. It uses a holistic approach in guiding the flow of energy through the body by employing intricate movements, prayers, and chants. The massage cleanses the body and mind of accumulated toxins and frees the soul of the burdens it unknowingly carries through the ancient theory of “mana”, which believes that the source of all power lies deep within our inner self. The Lomi massage uses a combination of breathing exercises, medicinal plants, meditation, and of course, traditional massage to promote spiritual, physical, and emotional well-being at a much deeper level than otherwise possible. It’s a stress-buster in the real sense and an ideal way to relax, rejuvenate, and unwind.